In 2003, after having captured the imaginations of avgeeks and plane travellers in search of shorter flights everywhere since its first service flight in 1976, the supersonic Concorde was retired from service, having captured public imagination in a way that arguably no other modern passenger jet has. At the end of the same year, Bonhams conducted The British Airways Concorde Charity Sale, at which parts of the planes were sold. Since then, there have been occasional auctions of Concorde memorabilia, including the unmistakable nose cone. Now, to mark the upcoming fiftieth anniversary since the Concorde’s first flight in 1969, you too can own a part of her, with Bremont announcing the limited edition Bremont Supersonic in partnership with British Airways, who have donated metal from the G-BOAB Concorde, known as Alpha Bravo. The third Concorde to join BA, the aircraft was registered in 1974, and her first flight was from Filton to Fairford in May 1976. In September 1984 she set a distance record for an airliner with a 4,565 mile flight from Washington to Nice and in November of that year, she flew the inaugural charter service from London to Seattle via New York. The Supersonic is the eighth in Bremont’s series of historical limited edition timepieces, and comes in a edition of three hundred pieces in stainless steel, one hundred in 18 carat white gold, and one hundred in 18 carat rose gold. The case is 43mm x 14.5mm, with an open case back, and water resistant to 100m. Inside is the Swiss manual-wind Bremont Calibre BE-11M8 beating at 21,600VPH and with a power reserve of 8 days, which is noted in the power reserve indicator at 12 o’clock on the dial side. Aluminium taken from the G-BOAB has been machined into a decorated ring underneath the crystal. This will also feature a description of the plane’s number and registration, years of active service, number of supersonic flights, and her top speed. The visual references are also on the dial, with a discreet motif of the plane’s silhouette on the seconds sub dial. The dial itself is a sun-ray silver colour and pattern, with applied indices, and either blue steel, nickel or rose gold hands coated with SuperLumiNova depending on the metal variant. 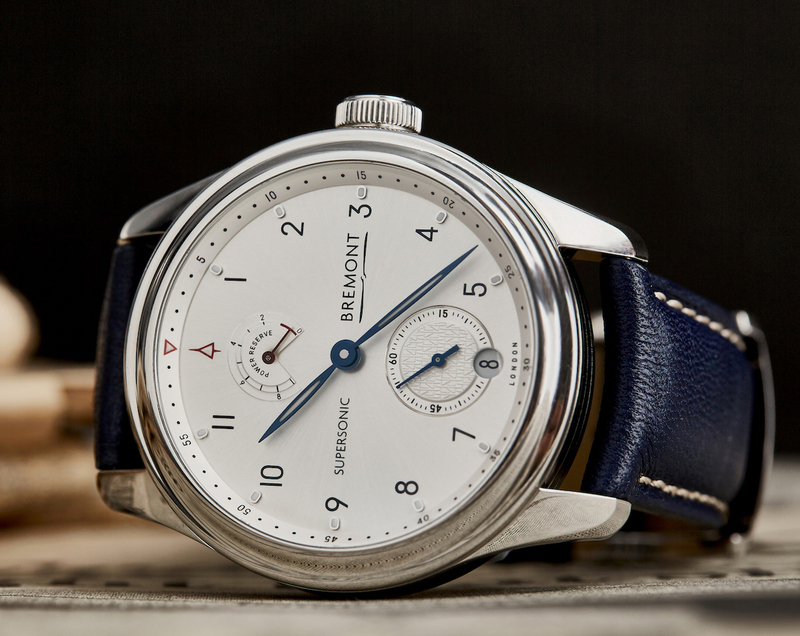 The Bremont Supersonic comes on either a Connolly leather strap in Concorde blue, a blue crocodile leather strap, or a brown alligator leather strap, with a pin buckle in the matching metal. Part of the proceeds from the sale of the Supersonic will be donated to the Air League Trust, an organisation that works with British Airways to support its ‘Inspire Gliding Scholarship’. Oh and if you’re wondering, a couple of years ago Airbus filed a patent for a supersonic jet.